All London's canal tunnels are on the Regent's Canal. 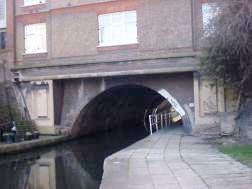 Are there two, or three canal tunnels? Only two are generally recognised today, Islington Tunnel (960 yards, or 886 metres) and Maida Hill Tunnel (272 yards or 251 metres). In fact a third very short tunnel exists, Eyre's tunnel, (53 yards or 48 metres) under Lisson Grove. Today this is sometimes incorrectly assumed to be a bridge. 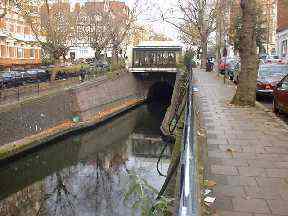 Maida Hill and Eyre's tunnels were opened in 1816 and are near to the junction with the Grand Junction Canal's Paddington Arm which is now known as Little Venice. 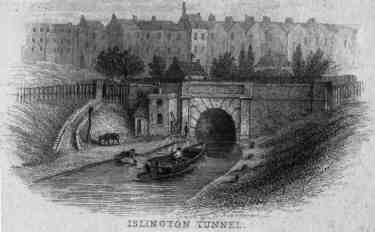 Islington Tunnel was opened in 1820 along with the completion of the canal, a procession of boats passing through with a band playing, to be met by a salute of cannon fire as they emerged at the eastern end. 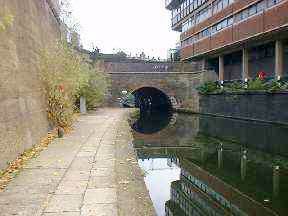 Islington Tunnel is the major engineering work of the Regent's Canal. The engineer who built it was the Regent's Canal's engineer, James Morgan. The early print illustrated to the left shows the west portal, probably in the very early days of the tunnel before the introduction of a steam tug. It also interestingly illustrates the type of open horse drawn boat in use at that time, confirmed by other contemporary illustrations. 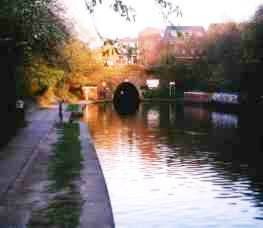 The photograph to the right shows the same portal in 1998, at sunset. It is just possible to see the light at the other end! The Company initially launched a competition for the design of the tunnel. The advertisement was placed in August, 1812, but elucidated little response. A committee of three eminent engineers, Nicholson, Walker, and Jessop, were to be judges. They received only wild ideas and the prize of 100 guineas was awarded to a copy of a Jessop design, which was evidently not considered suitable. The competition having been something of a fiasco, James Morgan was ordered to get on with it and so he did. There were delays in starting work as a result of the usual difficulty - landowners! Work must have started in 1814 for in January 1815 four of the six shafts had been constructed and 140 yards of tunnel built. By March 250 yards had been built and all four shafts were linked at tunnel level. Tunnels were built by the process of sinking shafts at intervals to the required depth, and then lowering men and equipment down to dig, and, it was hoped, meet. Accurate survey work was essential in order to locate the shafts in the correct place and dig them to the correct depth. That the tunnel is more or less straight indicates that this was done well, although difficulties meant that headings, small pilot bores, had to be constructed between shafts initially to ensure it. Things did not progress quite so well later in the project however, and Morgan found the earth through which he was digging to be a lot less stable than had been anticipated. A vein of stone caused ingress of water. Mindful as he doubtless was of the collapse of a road tunnel at Highgate in north London, Morgan used substantial temporary support structures and used stronger brickwork and in places additional brick lining to add strength. Springs were encountered in the digging of the shafts which made extra work necessary. The tunnel cost nearly £40,000 to build, a great deal more than had been anticipated. This was hardly unusual, and indeed even today major civil engineering projects frequently end up costing much more than expected! The tunnel was completed at the end of 1818 although not opened for business straight away. The picture (above, right) is of the east portal of the tunnel in 1999. The tunnel was at first operated by "legging", whereby men lying on their backs on planks aboard the boat walked the vessel through against the side walls. This was slow, hard, and caused a great deal of delay. 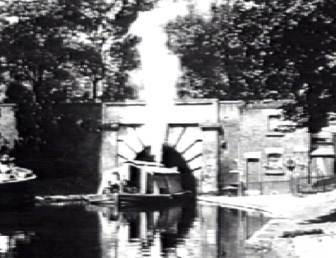 In 1826 a steam chain tug was introduced, one of the earliest uses of steam power on the canals. On one occasion in 1880 it caught fire and sank.The picture to the right shows the tug in 1924 (from the film Barging Through London) The chain was secured at each end of the tunnel and the tug pulled itself and a train of barges by winding the chain around a barrel on board. This means of haulage survived over 100 years until the 1930s when boats with engines became commonplace. The caption from the film (above, left) makes clear the conditions in which the boat and tug crews had to work!. During the winter period at the start of 2000, Islington Tunnel was closed for extensive repairs (pictured, left). In June 1818 Thomas Telford inspected the tunnel and is quoted as describing it as "Perfect, the materials and workmanship excellent, and its direction perfectly straight". It has lasted 183 years, so far! 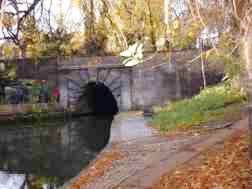 Maida Hill Tunnel from the west. A restaurant overlooks the tunnel mouth, giving luncheon customers a first rate view of the frequently passing trip boats, in summer. Maida Hill Tunnel east portal. The portal is disfigured by the ugly design of the housing for electricity supply cables which are routed under the towpath. Eyre's Tunnel from the west. It carries Lisson Grove over the canal. 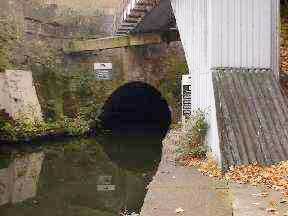 The short Eyre's tunnel is the only one with a towpath, now fenced. The East portal, over which a building now hangs.